Oracle Enterprise Manager has grown and matured a lot in the past few years with the latest release allowing you to fully manage your Cloud from a Single Interface. It’s not just Private Cloud or Public Cloud Management anymore, it’s actually Hybrid Cloud Management. The latest offering, Enterprise Manager 13c, addresses both public and private cloud concerns through new enhancements that manage, migrate, test and deploy applications and databases across hybrid clouds, with 100% reuse of existing management tools and practices. These enhancements will provide centralized visibility and control to Oracle customers on their cloud journey, while helping to ensure that their existing company-wide standards are applied across the estate. Oracle Enterprise Manager today is the nerve center of IT operations among thousands of enterprises, while it’s on the back of Oracle’s very own public cloud operation. This release has been focused to make monitoring cloud scale and resilient. One of the big things in this release is the unification of hardware and software management. See “Oracle Enterprise Manager 13c Hardware & Virtualization Management”. Of course, there are many more new exciting features (see the full list) as well as hundreds of enhancements introduced into the existing features, but this is not the focus of this post…. “I think I can! I think I can!” This well-loved classic tale of the Little Blue Engine who isn’t afraid to try has and will continue to inspire and entertain generations of children. The ‘For Dummies’ brand with more than 200 million books in print and more than 1,600 titles, is the world’s bestselling reference brand. The past few years licensing the use of the books by large vendors seems to be very popular. These can often be picked up as print freebies at conferences or as ebooks online on specific topics online. Oracle has been offering such eBooks for quite some time and in the past we have referenced several such titles available from Oracle. Here’s the list of currently available topics and ebooks offered freely by Oracle…. Version 5.0 of the open-source virtualization software VirtualBox was released on July 9, 2015. This is the first major release of VirtualBox since 2012, and it contains substantial improvements. This latest release by Oracle, demonstrates its commitment to the software, which was acquired as part the purchase of Sun Microsystems in 2010, and enables organizations and developers to more easily and flexibly create and deploy on premises and cloud applications. Oracle VirtualBox 5.0 brings in a range of useful changes and improvements that truly justify a whole integer increment. On paper, the list of new features is impressive and useful. Some of it is geared toward home users, some toward server deployments, and all of it toward having a good and powerful virtualization product…. Oracle Database 12c is here, complete with more than 500 new features. Oracle Database 12c introduces a new multitenant architecture that makes it easy to deploy and manage database clouds. Innovations such as Oracle Multitenant, for consolidating multiple databases quickly, and Automatic Data Optimization with Heat Map, for compressing and tiering data at a higher density, maximize resource efficiency and flexibility. These unique advancements, combined with major enhancements in availability, security, and big data support, make Oracle Database 12c the ideal platform for private and public cloud deployments…. 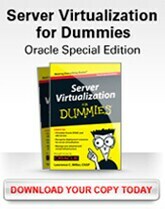 To learn more about how Oracle’s server virtualization solutions can help you eliminate complexity, reduce costs, and respond rapidly to changing needs, download Server Virtualization for Dummies, an Oracle Special Edition eBook…. Oracle has recently introduced a new Oracle Database Product. After some naming changes, from Comet, to Oracle Unbreakable Database Appliance,we finally landed on Oracle Database Appliance (ODA). Oracle announced the Oracle Database Appliance, as an engineered system of software, servers, storage and networking that offers high availability for a wide range of custom and packaged OLTP and data warehousing application databases. The Oracle Database Appliance is Built using the latest release of the world’s #1 database,the Oracle Database 11g Release 2 and protects databases from server and storage failures with Oracle Real Application Clusters and Automatic Storage Management on a 2-node Sun Fire server cluster running Oracle Linux.